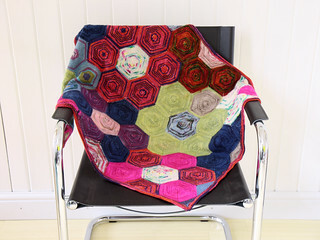 My newest pattern – Cerys Hexagon Blanket – is finished! This modular blanket is made up of (you’ve guessed it) knitted hexagons. 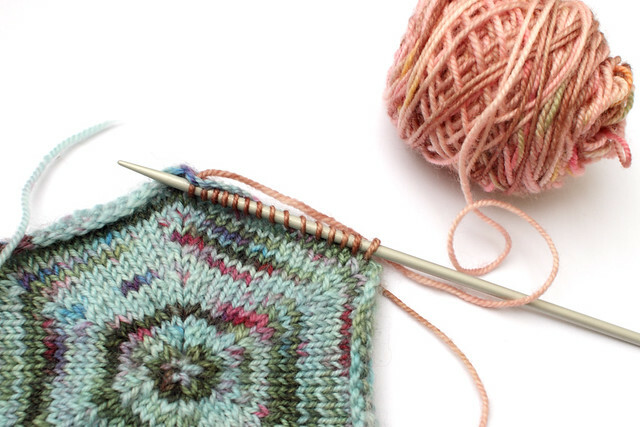 It can either be worked in sock/4ply yarn for a baby blanket, or aran/worsted weight yarn for a ‘grown up’ blanket. Two design charts are included; one for a traditional daisy patchwork design, and a blank chart for your own design. Full details are on the pattern page, and on Ravelry: Baby blanket | Grown-up blanket, or you can add it to your Ravelry queue. It looks like you’re using an RSS reader, so the link above wont work for you. If you view this post on the website, the link will work just fine. You might notice that I have switched the currency for patterns to US dollars. Brits – I hope you’re not disappointed! We have an easier time, I think, understanding dollars than our American cousins do with pounds. It was a surprise to me that most of my pattern sales are outside the UK, so I think this makes the most sense.